Real life ghost stories, do you have one? One of the more interesting comments I get in Haunting Danielle reviews, is when a reviewer says the stories are realistic. That’s a high compliment for stories many would consider fantasy as opposed to reality. Of course, many people believe in ghosts. Do you? Personally, I have never seen a ghost. Yet, I’ve spoken to people who claim to—including one person whom I deeply trust. She doesn’t broadcast her several encounters, fearing others will simply think she is nutty. But, I believe her. I did have one sorta ghostly encounter—which will explain why the ghosts in my stories, especially those who haven’t mastered harnessing their energy—can usually screw with electricity. After my father passed away, our family was living at Havasu Palms. Havasu Palms, a resort located on Lake Havasu, consisted of a mobile home park, marina, store, and restaurant. For some thirty years my parents (then just Mom after Dad died) were major shareholders, and for the last almost decade of owning the park, my husband and I were its general managers. We were living in a mobile home down the road from my parent’s. Dad had recently died, and my mother was visiting my sister in Bishop, California. My husband, kids, and I had just returned from our house in Wrightood, California. The first thing I did, was check on my parent’s—well technically it was just Mom’s—mobile home, to make sure everything was okay. I did a walk through, and everything was just as we left it. About an hour or so later, we decided to go back over there—so my husband could sit in the spa and the kids could watch TV. The minute we walked into my parent’s mobile home, the kids yelled, “Hello Grandpa” and I yelled “Hello Dad.” Yes, we were weird like that. Dad had not been gone long, and we felt compelled to say hello…just in case. In the next moment—right after we shouted our greeting—the VERY next moment—the hall light (which I had turned on when I went over there earlier) literally exploded, and the clock radio in the master bedroom went off—and the music started to blare. Did I mention, no one ever used that clock radio as an alarm? And no one had been home to set it. Do you have a real life ghost story? If you do, please share it here! 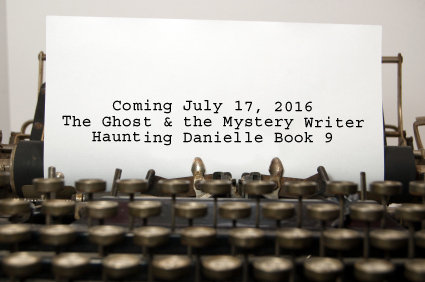 Tagged: ghost stories, Haunting Danielle.